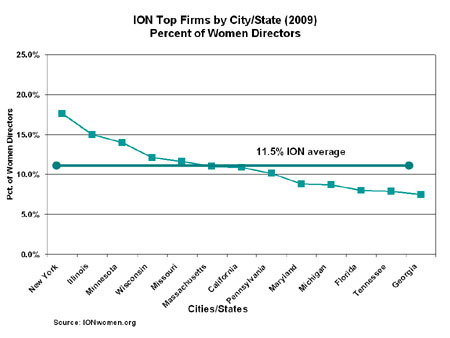 The sisters of The InterOrganization Network (ION), (www.ionwomen.org) now numbering 13 members, released their 2009 surveys of "the magic number" -- the share of women on corporate boards of directors at "top companies" and at Fortune 500 firms. The reports began in 2006 with 8 member organizations. (See: ION Members - Interpreting the Research.) The individual entities are listed in the table to the right, showing their respective shares of women directors. Most of the organizations report on top companies in their state. However, the New York data (representing data as of 2007, while released in 2009) presents the top 100 firms in "the greater New York metropolitan area" which includes Nassau and Suffolk Counties, Fairfield County, Connecticut, and parts of northern New Jersey. Seventy of these multi-state firms are included in the Fortune 500 list, although New York in fact had only 56 firms in that category. 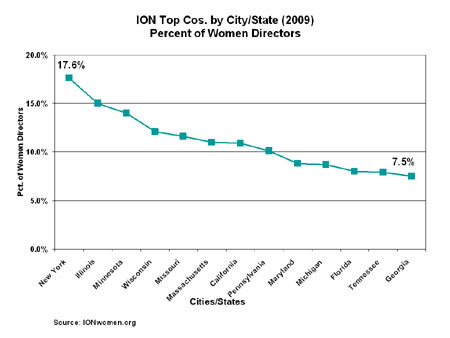 The share of women corporate directors ranged from a high of 17.6% in the greater New York region down to 7.5% for Georgia as shown in the declining line chart to the right. The Pennsylvania data covers only businesses based in Philadelphia, thus excluding major companies elsewhere, such as in Pittsburgh. Adding these five companies brings us to 32 Fortune 500 firms for the state of Illinois, a total board headcount of 355 of which 81 are women, for an overall still impressive share of 22.8% (not the 16.8% indicated in the ION report). The size of the census samples are not the same, as shown in the chart to the right. The number of companies studied range from lows of 28 in Michigan, 32 in Kansas/Missouri to 150 in Georgia, 161 in Florida and a high of 400 in California. There also is a wide variety in the membership or data gathering organizations, themselves. In selecting the geographic area represented in the census, the ION members excluded two states that are home to a large number of Fortune 500 firms: Texas and Ohio. New Jersey and Virginia are two other major states with significant numbers of Fortune 500 firms not represented in the ION reports. 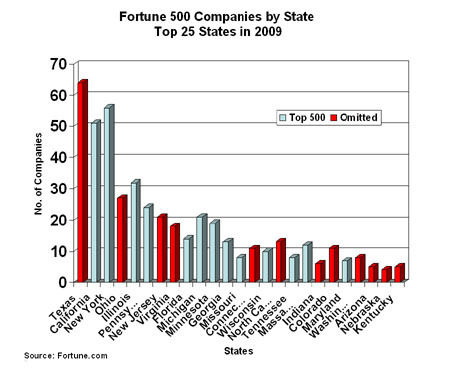 The chart to the right shows how many of the top 25 states with the most Fortune 500 firms are omitted because the ION members selected the areas they did. The member organizations are now collaborating on their reporting methods. Most of them now include executive officers and top compensated executives. However, they continue to emphasize the negative, rather than the progress being made. All members report the number of zero-zero companies (those with no women directors or executives). They argue that the high average age of white, male directors warrants a large-scale effort to replace them with younger women and candidates of color. All of the organizations continue to echo the "business case" argument that 3 women constitute a "critical mass" on a board and that greater numbers of women on boards "co-relate" to increased profits. The two charts below show another problem with selecting different size samples. The left chart shows the share of women directors for the top companies in the state, while the right chart shows the share for the largest firms, the Fortune 500, from that sample. In 2006, the ION average was 10.2%, while the Catalyst Fortune 500 firms averaged 14.6% in the same period. Generally, larger firms tend to have higher shares of women directors. 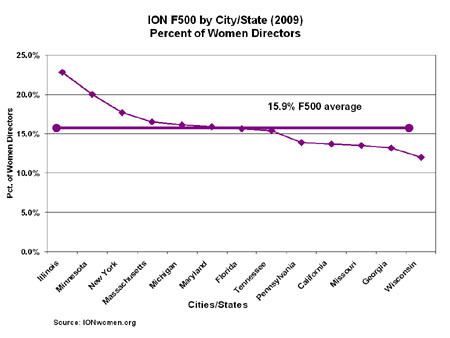 By focusing on the top 100 firms in the state, rather than Fortune 500 level firms in those same states, the ION members include more smaller companies, resulting in an average 4.5% lower share of women directors in their studies. By presenting the lower average scores, the "bad news" is exacerbated, the newspapers pay greater attention, and more "Action Required!" imperatives can be espoused. If enough women advocacy organizations keep singing the same chorus, it must be true. The good news about the ION reporting is that some are finally beginning to focus on the women who actually are in leadership positions, as directors and executive officers. The real need is to better broadcast the names and positions of women in top leadership roles, to highlight for boards where they could find top talented candidates. 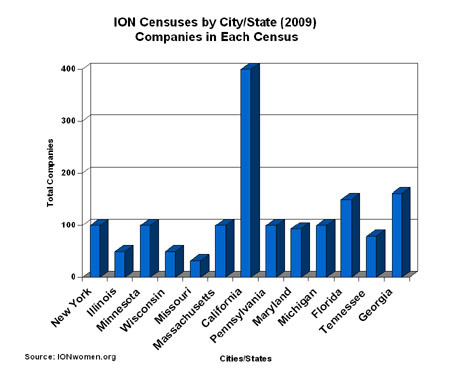 The ION members need to double-check their simple addition and standardize the size of their census -- say, settling on the top 100 companies in each of the 10 to 15 major states. There needs to be agreement on selecting the geographic area: comparing 400 firms in the State of California with 100 firms from three metropolitan areas in states surrounding New York City does not facilitate comparability. Also, excluding suburban companies, as was the case in Chicago and Philadelphia, seems arbitrary. Including Tennessee, but excluding Ohio, is difficult to understand. 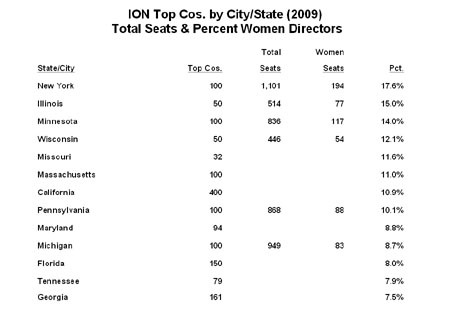 The ION reports should standardize on their presentation: itemize the actual number of total board seats and actual number of women-held board seats as well as percentages so that we can easily "roll up" the data to aggregations. Standardizing the reporting periods so we compare data within the same calendar year would also be advisable. Most importantly, though, it is time for the ION reports to separate their data reporting from their editorial opinions. We do not need a covey of private, nonprofit, by-invitation-only women membership groups simply adding their ire to the fire. When the ION members exercise their vote as shareholders or as stakeholders in these corporations, they have the opportunity to decide specificially when a director is "too old" or "not qualified" to perform. If the ION member organizations, themselves, were profit-oriented corporations, perhaps that might afford us the opportunity to evaluate their boards of directors, their productivity and their performance. Until then, the best value the ION reports can provide is to ensure that their data is accurate, complete, and comparable -- just like the public, corporate reports on which they rely.